You can also make sisig with seafood! 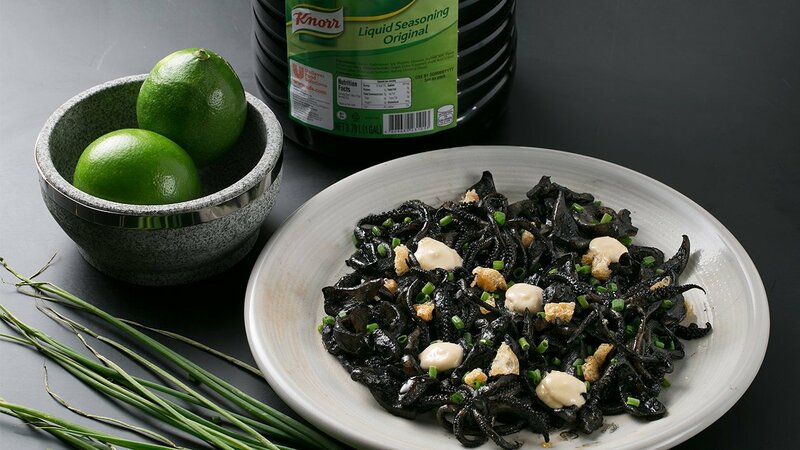 Make eating more fun with your eyes with this black squid ink recipe. In a bowl, marinate squid with Knorr Liquid Seasoning, Knorr Rostip Chicken Seasoning Powder and paprika for 30 minutes. In a wok, sauté onions, garlic and chilli in oil over high heat. Add marinated squid then add the squid ink. Mix all the ingredients in a stainless steel bowl with a whisk until smooth and fully incorporated. Put it on a plate then garnish it with aioli, chicharon and spring onions.